You all know I’m from Syria and part of my family is Lebanese so we’ve got the whole Middle Eastern food-making down. 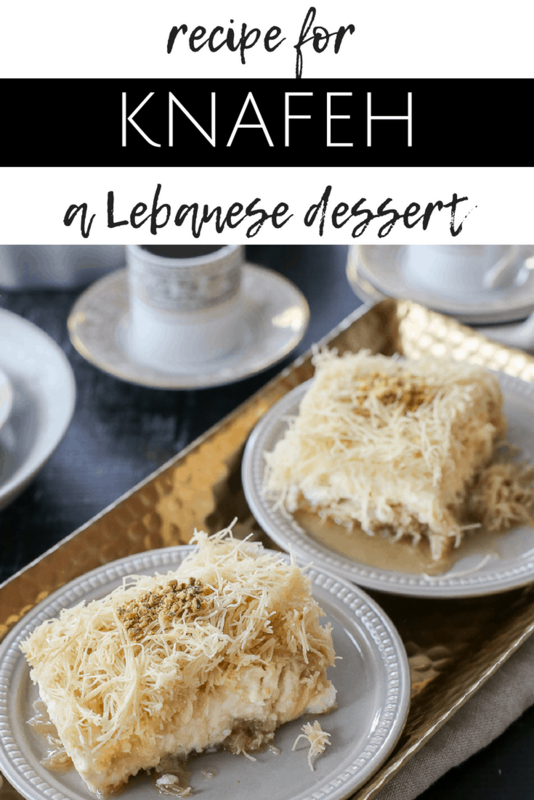 While we love American, Italian, and any other food out there, we have a special place in our hearts for Middle Eastern food, namely Syrian and Lebanese foods, especially desserts like this dish called knafeh. The Levantine culture is rich in food culture and it’s always amazing to see which foods gain popularity here. Baklava, hummus, baba ghanoush and stuffed grape leaves have made their way into the USA but they’ve only scratched the surface in terms of Middle Eastern food culture. 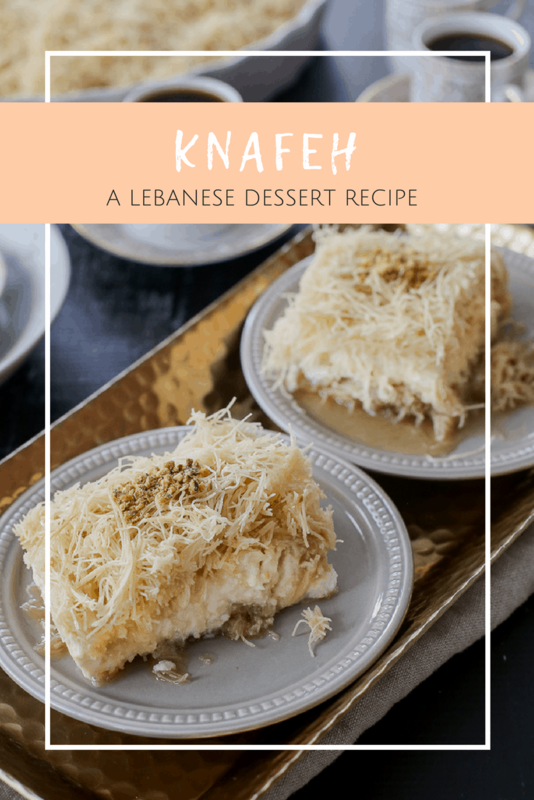 Where to buy knafeh dough? 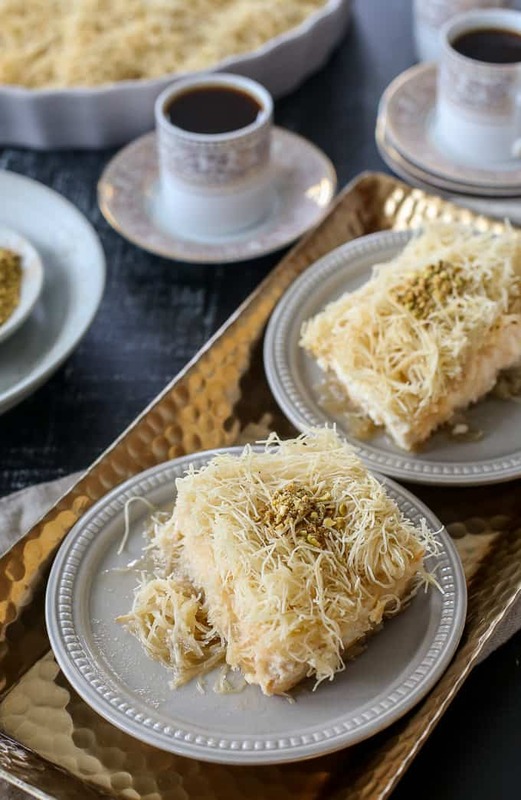 Knafeh, pronounced ka-na-fe (yes, the one time where the k is not silent) hasn’t quite reached stardom yet unlike its counterpart baklava which seems to be EVERYWHERE today. But trust me, knafeh is equally delicious and lucky for you, can be made at home. 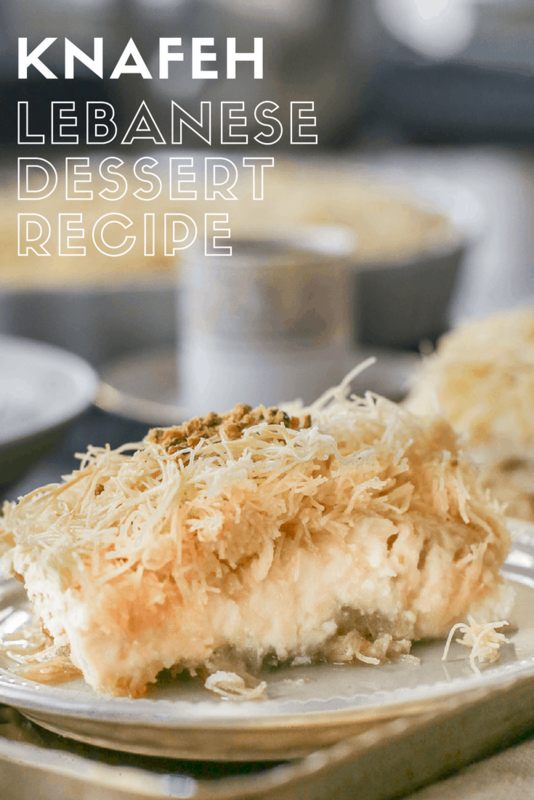 To sum it up, this dessert is a Middle Eastern dessert with a shredded phyllo dough (kataifi) base, sweet cheese filling and an amazing syrup made with orange blossom water that is poured over top. I love orange blossom water and if you can get your hands on the stuff, you’ll understand why. Traditionally, we serve the knafeh with Arabic coffee – they go hand in hand and it is a great way to finish off a meal. 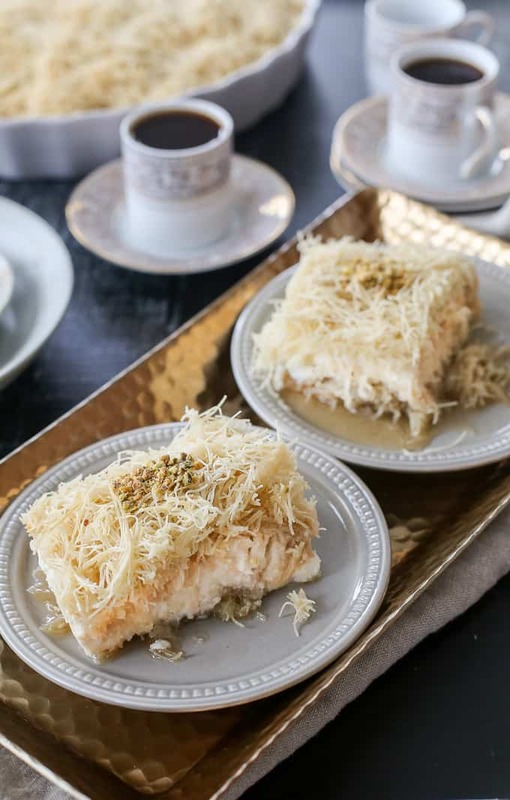 If you buy knafeh from a bakery or dessert store, it will usually come drowned in syrup. Arabs love sweets and especially syrupy desserts. While they all taste amazing, sometimes it can get too sweet (this is why bitter Arabic coffee comes in handy). 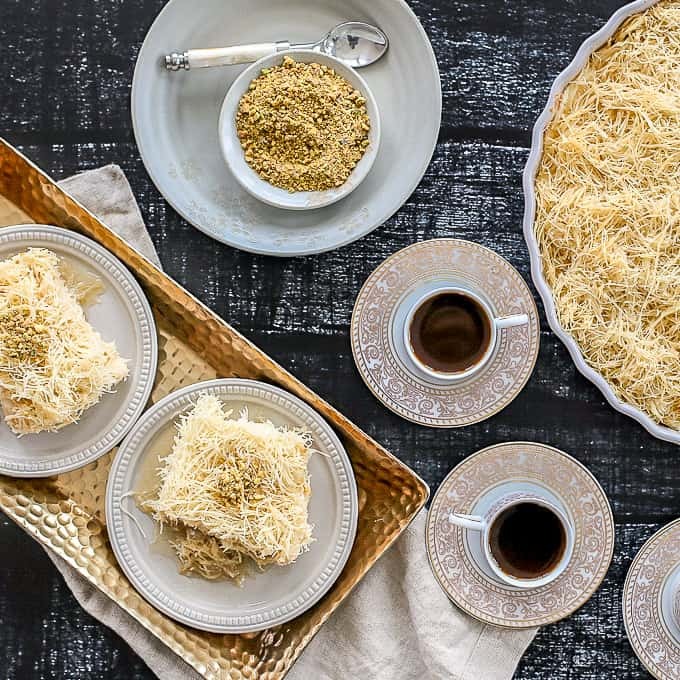 So when you’re making knafeh at home, you can tailor how much syrup your dessert gets according to your preferences or just brew a cup of coffee to go along with it. You will mix the kataifi with butter and use that as a base for the Lebanese dessert. Then you’ll spread either mozzarella cheese or ricotta cheese over top. Traditionally, we use a special Middle Eastern cheese but either of the above cheeses do the job well. Then you top that layer with the remaining kataifi, add some crushed pistachios and then top with a syrup. Really easy steps! Knafeh dough can be purchased at any Middle Eastern store. Sometimes even Amazon will have it for sale but make sure you don’t overpay for a box; typically they run around $5-6. Orange blossom is easily found on Amazon as well and for a great price! Yes – this dessert is best served warm so you can reheat it if you’re having it next day. I wouldn’t recommend microwaving it as the vermicelli-like dough might get soggy. I would recommend toasting it lightly or just reheating in a toaster oven. Yes – you can freeze it but I definitely wouldn’t recommend doing so for a long period of time. And remember that if you do freeze it, you’ll have to thaw it and then toast/reheat it again until the cheese melts. 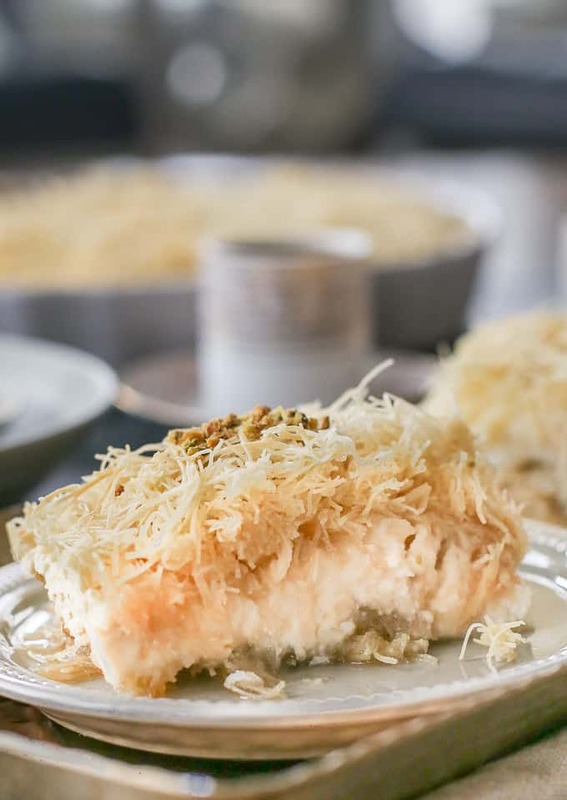 Unfortunately, knafeh is not gluten free as the phyllo dough is wheat-based and like most Middle East desserts is not exactly healthy but it is 100% worth every single calorie! Preheat oven to 350 F. Combine kataifi with melted butter making sure they are fully incorporated together. Press half of mixture into a 9×13 dish (or one equivalent in volume) and bake for 15-20 minutes or until phyllo dough layer is golden brown. Remove from oven and spread the ricotta cheese evenly over the crust (if using mozzarella, you can arrange the slices tightly together). Top with remaining kataifi/butter mixture, pressing evenly across baking dish. Bake for 30-35 minutes or until golden brown on top. While dish is baking, heat sugar and water together until mixture comes to a boil. Boil for 1-2 minutes or until thick, coating the back of a spoon. Remove from heat and add orange blossom water and lemon juice. Take care that water does not get into syrup. Once the kataifi is finished baking, remove from oven and pour sugar syrup evenly across dish. Allow to settle for 1-2 minutes. Slice knafeh into squares, top with a sprinkle of pistachios and serve warm. This looks so good, Grace! I’ve actually never heard of this dish, but I love anything with filo dough. Congrats on your new opportunity! That is so exciting, and I can’t think of anyone better to teach cooking skills than you! I’ve never heard of this desert, but it looks delish! Being Greek, I’m familiar with baklava (although I’ve never made it). Will check out your class ~ sounds like fun !! Watched your videos and I thought they were quite good! I found the introduction video really interesting as I’m not familiar with Syrian or even Lebanese cuisine or culture. I really want to make the layered ‘cake’, but will need to half the recipe for the spouse and myself. I have a bunt pan, but if I cut the recipe in half, I hope a cake pan will work as well.